Split in Half / Al Naslaa -  An epic journey of new discovery so fantastic that our natural instinct would be to block it out. There are many natural occurrences that might puzzle a traveler. One of them is Al Naslaa Rock Formation, located in Tayma oasis, Saudi Arabia. Recent archaeological discoveries show that Tayma has been inhabited since the ancient times. Al Naslaa is one of the most photogenic petroglyphs in the area. The perfect slit between the two standing stones and the flat faces are completely natural. Note the small pedestals supporting the boulders. How long will they remain balanced here? How did the cut in the middle happen? Most likely the ground shifted slightly underneath one of the two supports and the rock split. Could be from a volcanic dike of some weaker mineral that solidified there before everything was exhumed. Or, it could be an old pressure crack (you see a parallel crack just to the right of it) that has been pushed/pulled apart some. Or, it could be an old (minor) fault line, since fault motion often creates a zone of weakened rock that erodes relatively easier than the surrounding rock. Ever since its discovery in 1883 by Charles Huver, the megalith stone in Al-Naslaa has been at the heart of conspiracy theories and controversy. Why? Just look at the picture below, and the answer will be found. This megalith has been the topic of debate for many years ever since its discovery. The straight, sharp and precise cut down the middle of the megalith would be the reason why. It is extremely quirky and out-of-this-world (literally) that this is an un-achievable feat in the days that the megalith originated from. Laser? This technology is still new, even to us, centuries and millenniums later. How was it possible for them to split a megalith in such a precise way, other than the use of technology? Many have speculated about this, but none have discovered the true origin of the stone. Many experts have come and gone, but the mystery of this megalith is still as shrouded as the first day it was found. Today, many tourists flock to this mysterious rock to see it with their own eyes. ​Tayma remains uninhabited since the bronze age. Archaeologists have concluded that Tayma was an important land route between the Red Sea coast of the Arabian Peninsula and the Nile Valley, which was heavily populated at that point of time and was probably used for trading purposes. 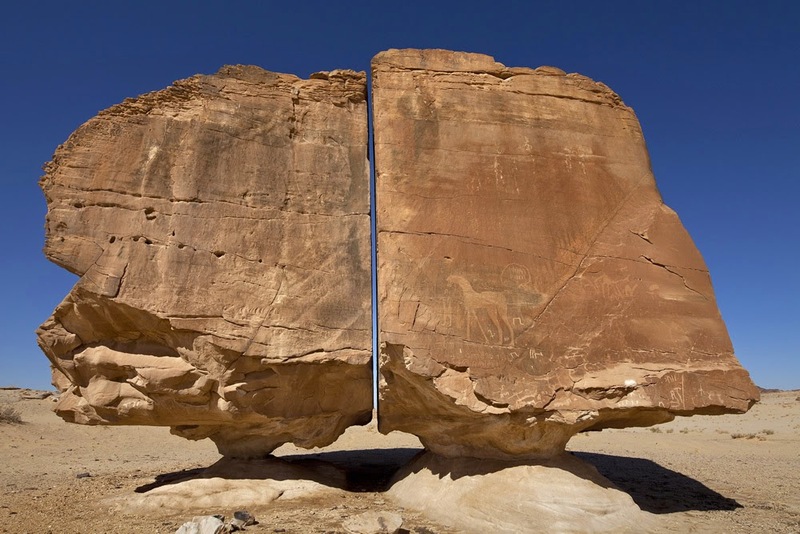 Many theories have been circulating about Al-Naslaa's megalith, and one logical one that stands out is the theory that the division of the rock into perfect halves down the middle was caused by the movement of earth underneath the rocks over the centuries. These little vibrations formed minute cracks on the rock's surface, which caused it to split directly in the middle after centuries. However, many questions if a work of nature can be so precise, and the cut is too neat and clean. This leads us to the next theory: Is there an entire civilization centuries or millennia ago that actually have technologies more advanced than what we have now, but have been completely and absolutely erased by the sands of time? In order to unravel the mystery of this megalith, the only logical way would be to travel back in time to when the stone was formed. Archaelogsts have figured out that the oldest mention of the oasis city is dated back to 8th century BC, where it appears as "Tiamat". Moreover, Cuneiform inscriptions have been found possibly dating back to 6th century BCE at this oasis city. The biblical eponym is apparently Tema, one of the sons of Ishmael, which has been mentioned several times in the Old Testament. It has also been claimed that for a part of his reign, King Nabonidus entrusted the kingship of Babylon to his son, in order to go to Tayma for worship and look for prophecies. Not only mysterious, the location of the megalith is also rich in history. No one knows the answer to this mystery of the formation, and as time passes, it seems almost impossible to solve. Was it really cut by technology far more advanced than ours? Was it formed by the earth itself? The questions are endless. But at this moment, everyone is still left puzzled by the very same question that was first asked. "Why, and how exactly did the Al-Naslaa come into formation?" Maybe, time will tell in the very end. Mada’in Saleh, not far from al-Ula (22 km), was known as al-Hijr, or Hegra, by the Nabataean people who carved its magnificent tombs into the golden Quweira sandstone outcrops. The delicate details on the entrance portals and the smooth surfaces of its 111 tomb façades reflect the great skills of the masons of their time. The splendor of the natural setting here must have reminded the Nabataeans of their capital, Petra, hewn into the rosey sandstone cliffs to the north in modern-day Jordan. It is no wonder that they chose this very spot to build their second city, Hegra. Based on the many dated tomb inscriptions, Hegra thrived between 1 BCE -74 CE. The Nabataeans began as pastoral nomads, raising their sheep, goats, and camels in the desert as so many other Arabian tribes have done through the millennia. They also practiced oasis agriculture, utilizing a set of wells dug into the rock. Their origin is uncertain, but there is a strong possibility that they came from the Hejaz region of northwest Saudi Arabia. The deities they worshipped were similar to those honored by ancient cultures in that area and the root consonants of their name – n, b, t, w – occur in the early Semitic of the Hejaz. From early in their history, they had connections with Mesopotamia and may have been the Nabatu Arabs mentioned by the Assyrians in the eighth century BCE. Alexander the Great’s officer Hieronymus of Cardia wrote of the Nabataeans as having an ascetic life with harsh laws. They were also known for their incredible familiarity with the desert and their ability to fade into it to evade enemy tribes. Their system of hidden cisterns dug deep in the interior provided water for their livestock and their people. The real cause of the success of the Nabataeans, however, was control over much of the spice trade. Frankincense, myrrh, and other spices from southern Arabia were brought up to the north along trade routes to be purchased by the Greeks, Romans Egyptians, Phoenicians, and others around the Mediterranean and in the Near East. The Nabataeans built their empire as the middlemen. Hegra was a crossroads where the major north-south incense route intersected a road from the Red Sea to the Persian Gulf. Before the Nabataeans chose Hegra as their most southerly outpost for caravans on the spice route, the settlement was occupied by their predecessors in the trade, the Dedanites and then the Lihyanites. The Qur’an refers to a Thamudic settlement even earlier. The Romans annexed the area controlled by the Nabataeans and incorporated it into its Arabian province in 106 CE. The ruins of the town of Hegra lie on the plain some distance from their tombs. The buildings, still for the most part unexcavated, were made of unimpressive sun-dried mudbrick. What is known about Hegra comes primarily from the tombs, the many inscriptions carved into their façades, and references found elsewhere. The tomb façades are finely carved and fairly uniform in their style. At the top of most is a pair of crowsteps rising up from a central point. One or two cornices are just below, resting on the delicate capitals of two pilasters. ​ A portal in the center of the façade provides the entrance to the tomb. Inside are recesses carved into the walls where the bodies of the deceased were placed. The interiors remain roughly chiseled in stark contrast to the smoothly finished façades. Qasr al Bint, “Palace of the Daughter or Maiden,” is the largest tomb façade at Hegra, with a height of 16 m. It lends its name to a group of adjacent tombs. The portal is raised above ground. Above the doorway is an inscription plaque saying that the tomb was carved by the sculptor Hoor ibn Ahi for Hani ibn Tafsy, his family and descendents, in the 40th year of the reign of the Nabataean King Aretas IV (al-Haritha), dating it to circa 31 CE. Qasr al-Farid, an unfinished tomb that stands alone. The most photogenic and most iconic symbol of Mada’in Saleh is Qasr al-Farid, a single tomb carved into a small dome that stands alone in the open. The façade was never finished, so the heavily chiseled surface of the lower third documents how the tombs were fashioned from the top down. The Jebel Ithlib is a monumental outcrop topped with a complex of spires in the northeastern part of the site. In the middle is a natural slit that measures 40 m (131 feet), called the Siq, after a similar corridor at Petra. At its entrance, to the right is a square chamber containing three stone benches that served as a triclinium for sacred feasts. Today, the chamber is known as al-Diwan (court). Its large entrance suggests that the feasts extended into the open space before it. By walking through the Siq, one enters a larger, natural alcove known as the Jebel Ithlib sanctuary where a canal channeled water into a cistern. Its enormous cliff faces have small sacred niches and altars carved into their otherwise unhewn surfaces. Jebel Ithlib was thought to have been a holy place to worship the Nabataean deity Dúshara, “Lord of the Mountain”. Mada’in Saleh has been s a UNESCO World Heritage Site since 2008.